Petite House’s Gelatier Siciliano Antonio meticulously blends freshly imported fruit and dairy with masterful precision, using no added sugar and relying only on the natural sweetness of the fruit, to ensure that you’ll get the same perfect mouthfeel with every flavor you try. Newly launched sensational summer flavors include dazzling Purple Dragon Fruit (HKD38), seductive Summer Passion Fruit (HKD38), irresistible Watermelon (HKD38), indulgent favorite Snickers (HKD38) and delicious creamy Coconut (HKD38). With an extensive range of new flavors, customers can also create their own mix by adding different toppings and sauces as desired. 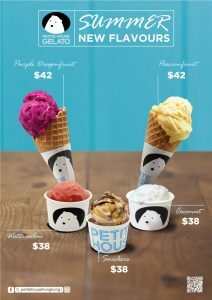 Aside from gelato, Petite House offers a wide variety of local-inspired snacks, including Egg Puffs, Banana Waffle, Mango Pancake and Melted Cheese Cups, to name a few.